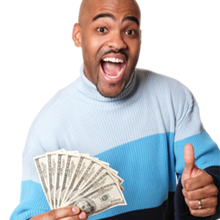 At Speedy Cash customers can obtain a payday loan, a title loan, a signature loan or simply cash their paycheck. In addition, Speedy Cash sells stamps, handles the sale and sending of Money Orders, and performs wire transfers and fax services. However, customers in some states may not be able to obtain all of these services or amounts because of the laws in their particular state.